Whoa, it’s been a while since I posted. Hi! This past semester I started my journey to becoming an “actual archivist” (instead of just someone who Has Naive but Big Questions About Archives). I learned (mostly) traditional archival theories in a class I wanted to like more, and dipped my toe into records management in a class I didn’t expect to absolutely adore. For my midterm paper in the RM class, I wrote a tremendously goofy but thoughtful essay about the trustworthiness of records on Star Trek: Deep Space Nine, submitted the day after Gul Dukat took over the Alpha Quadrant Donald Trump was elected. This past year also marked a new confidence in my research and writing – one that sadly eluded me throughout my MA! – and so, in commitment to giving myself credit for what my brain produces, I share it with you below. In the year 2369, Cmdr. Benjamin Sisko assumes command of the space station Deep Space Nine, the eponymous entrepôt at the edge of the Alpha Quadrant, and the heart of the 1990s series Star Trek: Deep Space Nine. This transition of leadership takes place following a long occupation of the planet Bajor by the Cardassian Empire – formerly known as Terok Nor, the station is of Cardassian origin, and is being transferred by the Bajoran provisional government to Starfleet, operating on behalf of the United Federation of Planets. The station lies between Bajor and a wormhole to the Gamma Quadrant, another corner of the galaxy, and so acts as a de facto border town connecting the Federation to many alien civilizations. DS9 exists at an overlap between a decolonizing nation, its occupiers, peacekeeping forces, and intergalactic economic flows, and so the recordkeeping practices of militaries, governments, and markets are all given screen time over the course of the series. Over the fifty years that Star Trek has been a televisual phenomenon, its producers and writers have conceptualized entire universes, timelines, and civilizations, with accompanying political, cultural, and economic institutions. These new worlds are made possible by the imagining of new technologies, including warp speed, molecular transport, and subspace communication, and with these inventions come new types of records created through movement, exploration, and commercial activities. Starfleet personnel regularly create and access these records in the course of daily operations, and the trustworthiness of records plays a critical role in several episodes of Deep Space Nine. In this paper, I examine the plots of “Duet”, “Second Skin”, and “In the Pale Moonlight”, three episodes that illustrate the the political structures and recordkeeping systems that create, manage, and archive the cultural memory of the Cardassian Empire. By considering how Cardassian records are accessed and understood as evidence in Bajoran and Federation contexts, I demonstrate how records exist as a powerful force of memory in a postcolonial state at times of war and peace, using discussions of their content, context, and structure that arise on the show. The circumstances of record creation and access are regularly represented in the Star Trek universe. From the original series onward, in nearly every episode, officers’ official and personal logs are heard in voiceovers or seen on screens. Ship and station transporters beam individuals from location to location, and records containing their origin, destination, time, and molecular composition are held in “pattern buffers” to facilitate and provide evidence of this transport. On Deep Space Nine, positioned at the nexus of trade routes and transportation corridors, crew and cargo manifests are submitted to station operations when ships wish to dock and disembark their vessels. These records are often created or accessed with voice-activated commands and queries, and visualized on display terminals across the station. As seen on screen in dozens of episodes, Starfleet records contain data and metadata properties familiar to us on Earth: names, dates in both Stardate and Gregorian calendar years, and unique identifiers for both individuals and records. Records are created through the substantive functions and processes of the space station, such as sensor outputs and communication logs, or captured using tools like medical tricorders and transporters. The facilitative functions of this Starfleet outpost are reflected in military records, security reports, and commercial transactions, down to the ledger of tabs at Quark’s bar. All of these reflect the multicultural constituencies and Federation/Cardassian technologies that Deep Space Nine is built upon. This early episode develops Major Kira Nerys’ past as an anticolonial revolutionary on Bajor during the Cardassian occupation, and her present role as a high-ranking member of the Bajoran militia on board Deep Space Nine, first officer to Starfleet’s Commander Sisko. The story is advanced as the integrity of Cardassian records and their metadata are questioned, while the social and political conditions that led to the flourishing of records in the Cardassian military and intelligence bureaucracies are further explained, as their archives will be returned to again and again throughout the series. This is not the first time Kira is forced to confront Cardassian records that conflict with her own memory of events. A transport ship requests permission to dock, noting that one of its passengers requires medical assistance. The patient, a Cardassian named Aamin Marritza, is beamed directly to sickbay, where he is found to have Kalla-Nohra syndrome, a condition only affecting those present at the Gallitep labour camp on Bajor, which Kira helped liberate. 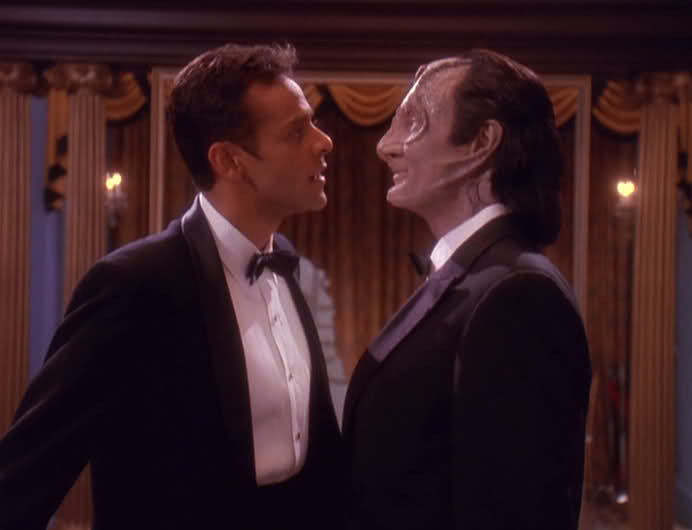 Kira insists that he be prosecuted as a war criminal, but after initially denying that he had ever been to Bajor, Marritza admits that he was indeed present at Gallitep, but he was a file clerk, and not directly responsible for any acts of violence. His story is corroborated by Bajoran and Cardassian records shared in response to security chief Odo’s requests, which include a citation of merit for his outstanding instruction of filing at a Cardassian military academy. However, the caption attached to an image shared by the Bajoran Central Archives (the only visual evidence of Marritza at Gallitep – “Cardassians destroyed almost all records of the occupation,” Kira explains) suggests that the man they are holding is not Aamin Marritza, standing elsewhere in the photograph, but Gul Darhe’el, the infamous “Butcher of Gallitep” who commanded the camp. Enhancement of the photo reveals that the man they have in custody is indeed Darhe’el. Kira interrogates him further, and he admits to his identity and brags about his role in the atrocities, citing Kira’s resistance cell as a particular annoyance to him. However, she later realizes that Darhe’el would likely not have known this information about her, as his role did not require access to these records. Darhe’el lies, crediting Marritza’s records classification system with bringing the information to his attention. Meanwhile, Odo reviews all requests for information about Major Kira, finding one external query from Marritza at the military academy. Sisko receives word from Gul Dukat, a commander on Cardassia Prime, that Gul Darhe’el is dead – he attended his funeral himself – but Dukat is enraged to learn that a man claiming to be Darhe’el is being held on DS9, and grants them limited access to records pertaining to Darhe’el, a request he initially refused. Darhe’el was not even present on Bajor the day of the mining accident, and was not a carrier of Kalla-Nohra as a result – records show he was on Cardassia, receiving a citation of merit. Upon viewing his death certificate, Kira argues that it is forged. The identity of the prisoner is confirmed with the receipt of records from the military academy where he was employed, as well as his medical records. Two weeks before his arrival, Aamin Marritza resigned his teaching position at the academy, settled his affairs, and provided a generous sum to his housekeeper. Along with the treatment for his Kalla-Nohra syndrome, he had been taking a dermal regenerative agent to aid in his recovery from significant plastic surgery. The caption on the photograph was indeed accurate: Marritza had altered his appearance and assumed the identity of Darhe’el, knowing his arrival on DS9 would trigger his eventual execution. No longer able to bear the guilt associated with the acts of violence that took place alongside him on Bajor, he wished to sacrifice himself as an act of reconciliation. He is released from custody, but is stabbed by a Bajoran survivor, and dies in Kira’s arms. Kira is contacted by a researcher who is interested in learning more about the conditions at a Cardassian detention centre where she was imprisoned, according to records held at the Bajoran Central Archives – this is a surprise to Kira, who was never held captive there. “If your memories and these prison records don’t agree, then one of them must be wrong,” Odo muses, suggesting that her memories of the time may be be false. However, her contact provides her with a digital copy of the record, and a “fellow” former inmate remembers her from their shared time in prison, which she does not recall. This leads her to book passage to Bajor to investigate the matter further, but she does not arrive. Kira wakes up on Cardassia, surgically transformed to look like a Cardassian, and is informed that she has always been a sleeper agent, one who posed as a Bajoran resistance fighter turned Deep Space Nine officer, and that her memories of her “old” life as the daughter of a Cardassian commander would return. She is interrogated for days by a member of the Obsidian Order, while her “father” takes a much more empathetic posture towards her return, relieved that she is alive and unharmed. As Kira maintains that she is not who he thinks she is, he gives her a data storage unit containing the video statement she recorded before her departure, encouraging her to watch it. Meanwhile, under further interrogation, it is explained to Kira that the Obsidian Order does not dispose of evidence obtained during investigations, which is held in perpetuity in their archives, and her captor transports the cryogenically-preserved corpse of a young Kira Nerys into the room. She refuses to doubt her own memories of her life as Kira, despite his claims that they were implanted in her at the time she assumed the dead woman’s identity, and develops a genuine connection with the man who believes she is his daughter. In the end, it is him, not Kira, that the Obsidian Order is after – the empathy he showed his “daughter” was the vulnerability they needed for him to admit to being a Bajoran sympathizer. All of the records regarding Kira’s imprisonment and life as a Cardassian turn out to be forgeries, and back on Deep Space Nine, DNA tests confirm she is Bajoran. This episode consists of a series of flashbacks sandwiched between segments of an entry in Capt. Sisko’s personal log, as he confesses to the events of the previous two weeks. Casualties are mounting as Dominion forces are invading Federation worlds, and morale is low on board Deep Space Nine, as the captain posts yet another list of the war dead. Lt. Cmdr. Dax suggests that Sisko attempt to persuade the Romulans to join the Federation in fighting the Dominion, a task which would require irrefutable evidence of the Dominion’s betrayal. Sisko understands the subtext of this conversation, and requests the help of the former Cardassian spy Garak, now a “plain, simple tailor” on DS9, to assist him in the forgery of records. Garak contracts a holographic artist to assist, but he is quickly arrested following a fight with Quark, the station’s bartender. Sisko requests that Odo release the forger and destroy all records of his presence on board, as it is a matter of Federation security. Odo consents, but notes that he must arrest him if Quark chooses to press charges. Sisko bribes Quark to keep the incident “off the record” by agreeing to several favours, including the processing of goods held by station security that he does not have import licenses for. He then receives another list of the dead from Starfleet Command. Garak acquires a one-time-use optolythic data rod for the forgery, used only for the storage of Cardassian military documents, which cannot be modified after it has been written to. This comes at the cost of a significant amount of biomimetic gel, a controlled substance held in sickbay. Chief Medical Officer Bashir demands Sisko’s order in writing, provides a formal objection, and notes the incident in the station’s medical log. The forger creates a three-dimensional holographic recreation of a meeting between the Cardassians and their Dominion Empire overlords, in which they discuss the invasion of Romulus – Sisko presents this to a Romulan senator, who correctly identifies it as inauthentic upon inspection of the data rod. Before he can return to Romulus with the news, his shuttlecraft explodes. Garak knew the plan would fail all along, but such a falsehood was necessary for survival against the Dominion. At Sisko concludes his confession in his personal log, he orders the computer to permanently delete the entry. Deep Space Nine illustrates that in the 24th century, the creation, capture, and management of electronic records have come very far, but determining their trustworthiness remains a significant challenge. Though many details about their management are left out for storytelling purposes, records play a crucial role in the advancement of many plots. The development of systems that ensure the usability of records is an evident success by the 24th century, as vessels and governments using the powerful Library Computer Access and Retrieval System (LCARS) and its variants have the ability to query, access, and translate records with simple voice commands that seem to transcend the issues that Heather MacNeil (2002, 36) identifies with natural language access points. Records created on other worlds appear to be outstandingly interoperable with Federation technologies including the Universal Translator, as Starfleet officers are frequently able to access the information within them without trouble. When Kira and her colleagues view her forged “prison record”, they see the record as reliable – it appears complete and able to see it standing for the facts of her imprisonment, requiring further inquiry. The optolythic data rod used to store the forged holo-record represents a Cardassian protocol used to ensure the originality and authenticity of military records, and their disposition in a secure military archive demonstrates that management plans exist for such top-secret records. However, “[n]ot all evidence is equally credible,” Geoffrey Yeo (2007, 323) writes. Advanced holographic technologies and the ability of androids to replicate the voiceprints of others put the credibility of audiovisual records at risk, as well as any voice-activated security clearance protocols restricting access to records. “In the Pale Moonlight” demonstrates the changing value of records in times of war – indeed, Sisko’s moral dilemma begins with his receipt of Starfleet’s latest casualty report (cf. Yeo 2008, 126). The Cardassian government is highly bureaucratic and is deeply intertwined with its military and intelligence services, and the creation and management of proper records keeps civil servants and officers alike out of trouble with Obsidian Order spies. These power structures, along with Cardassian colonization patterns, created incredible numbers of records, requiring great numbers of specialized staff, as reflected in their special substrates, disposition plans, and apparently infinite capacities for archival storage. Indeed, Cardassians are known across the galaxy for their ability to manage records, which may or may not be directly correlated with their military prowess and pride – such records are created not just to document transactions, but also with an eye to “inform posterity of their deeds” (Renier 1950, quoted in Yeo 2008, 126). The heavy corollary to such a view lies in what remains of the Cardassian colonial archive on Bajor. Yeo (2007, 330) explains that the “affordances of records include memory, accountability, legitimization of power, a sense of personal or social identity and continuity, and the communication of such benefits across space and time.” This is incredibly important to Bajoran survivors of the Cardassian occupation, as the absence of such records (or the presence of inauthentic ones) is used to challenge their lived experience, as seen in “Second Skin”. As has become apparent through the Truth and Reconciliation Commissions that have taken place in Canada and South Africa regarding Indian Residential Schools and apartheid, respectively, incredible numbers of records were destroyed by governments, churches, and other institutions, corrupting the archival bond created by holding these records in context (Harris 2002). Despite this important loss of context, the “official” status of these records, as much as their trustworthiness may be compromised, is nonetheless used to challenge the memories of traumatized survivors, as is seen in “Duet” and other episodes pertaining to Kira’s life before arriving on DS9. However, in “Second Skin”, the evidence “proving” Kira’s Cardassian detention was found in a Bajoran archive, indicating the transfer of records from the creating agency to a location where survivors can access them. More so than other science fiction shows, the Star Trek universe showcases the creation, capture, and use of records, alluding to their management and value through the illumination of their content, context, and structure. I argue that part of this is due to the award-winning production designers of Star Trek’s TV crews, whose visuals inspire user experience and interface design techniques decades later (Shedroff and Noessel 2012), but these discussions become especially nuanced on Deep Space Nine when considering the processes of colonization and resistance taking place in this corner of the galaxy. Harris, Verne. 2002. “‘They should have destroyed more’: the destruction of public records by the South African state in the final years of apartheid, 1990–1994,” in Archives and the public good: accountability and records in modern society, eds. Richard J. Cox and David A. Wallace, 205-228. Westport, CT: Quorum Books. MacNeil, Heather. 2002. “Methods for creating and maintaining electronic records as records,” in Preservation of the integrity of electronic records, eds. Luciana Duranti, Terry Eastwood, and Heather MacNeil, 31-37. Dordrecht: Kluwer Academic Publishers. Shedroff, Nathan, and Christopher Noessel. 2012. Make it so: interaction design lessons from science fiction. Brooklyn: Rosenfeld Media. Yeo, Geoffrey. 2007. Concepts of record (1): evidence, information, and persistent representations. The American Archivist 70: 315-343. ———. 2008. Concepts of record (2): prototypes and boundary objects. The American Archivist 71: 118-143.